Last year, we talked about Exxon's legal troubles stemming from oil spills and their acceleration of global warming. This year, it looks like another oil giant, Texaco/Chevron, will learn whether it must pay damages for irreparably polluting the Amazonian rain forest. A 1993 lawsuit, filed in 1993 by rain forest residents, alleges 1,401 deaths occurred from Texaco's dangerous operating procedures. 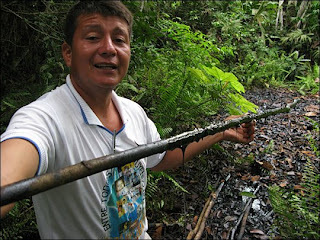 Chevron argues that their practices were in line with current ones, even those of the state oil company, Petroecuador. Donald Moncayo, an activist who works with the poor farmers and Indian plaintiffs in the case, takes visitors on what he calls "toxic tours." After tramping through the jungle, Moncayo reaches a huge pool of oily sludge and sticks a long pole into the muck. He says this is a legacy of Texaco's quarter-century in Ecuador: pollution that affects tens of thousands of people who bathe and drink from rain forest waterways. A verdict should be coming by the end of the year. 1993!?!?!? 15 years later, and the oil companies have not done a thing to remediate what they did and continue to do throughout the Amazon. It's likely nothing will happen until the oil companies get all the oil and leave the area. Then the people still living there will just be left with the mess.